Organisms depend on strict regulation of their genes for proper cellular function. This regulation is mediated by large protein interaction networks – the so-called interactomes. By analogy to the World Wide Web, interactomes display a scale-free architecture in which a few nodes – hubs – are highly connected and integrate multiple signals to regulate cellular responses (Fig. 1). Recently, the established structure-function paradigm stating that protein function is intimately linked to a fixed structural form has been challenged by the demonstration that regions with intrinsic disorder (ID), referring to structurally flexible and constantly changing ensembles of many different forms (Fig. 1), are also functional. ID is especially pronounced in interactome components such as gene regulating transcription factors, which act as final mediators of cellular responses. The flexibility associated with ID allows for easy rearrangement of binding sites, thus making multi-partner binding possible. While ID represents an obvious advantage in gene regulation, which requires fast rewiring, the details of ID-based interactions are just emerging from studies of model hub proteins such as Radical Induced Cell Death1 (RCD1). 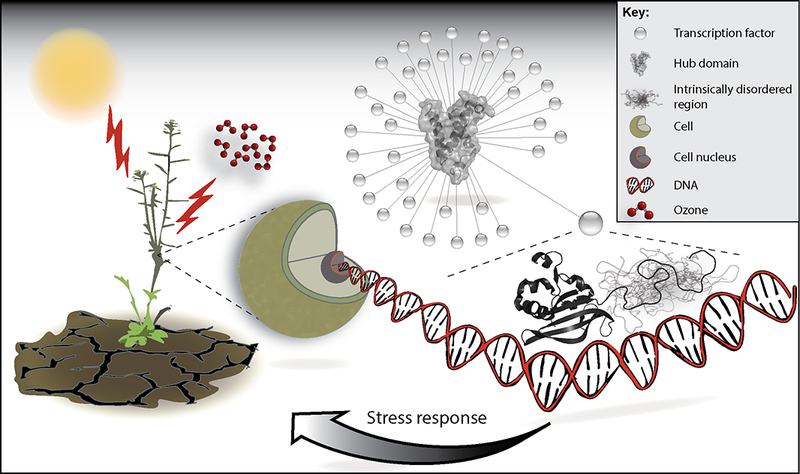 RCD1 plays many different roles in plant stress responses, in particular to drought, heat, and oxidative agents such as ozone, which significantly affect plant viability and quality (Fig. 1). Fig. 1. Interactome in gene regulation. Synthesis of transcription factors of interactomes may be induced by stress, as in the case of the plant RCD1-interactome. The transcription factors, which bind the central hub RCD1, also regulate target DNA (genes) to orchestrate cellular responses. Since the structure of the RCD1 hub domain remains unknown, the hub domain surface structure shown is based on the KIX domain (PDB code 1KDX). In our manuscript, we address how RCD1 can interact with many unrelated transcription factors. Interestingly, the transcription factors of the RCD1 interactome contain ID regions. Interactions between ID regions, such as those of the transcription factors, and structured hubs, such as RCD1, often rely on short linear motifs (SLiMs). SLiMs consist of only 6-10 amino acid residues and are challenging to find due to poor conservation. Once found, SLiMs can help expand interactomes with essential cellular functions (Fig. 2A). Using a combined computational and experimental approach, we identified the RCD1-binding SLiM (Fig. 2A). Surprisingly, we also found that the ID regions surrounding the SLiM in the various transcription factors dramatically affect binding – either negatively or positively (Fig. 2B). This empowers the flanking regions with important functionality, even though they appear like simple passive frameworks. Using nuclear magnetic resonance spectroscopy we furthermore addressed what happens to the SLiM at the atomic level upon hub binding. Coupled-folding-and-binding is becoming a paradigm for ID-mediated interactions. Unexpectedly, while local structure was induced in one of the transcription factors, no indication of structure was detected in others, even after RCD1-binding (Fig. 2B). However, although they do not adopt a shared structured form, they all recognize hydrophobic anchoring points and positive charges on the RCD1 surface. Furthermore, one complex may entail a set of different forms. Such different forms in the bound state, referred to as fuzziness, represent a novel concept of relevance to ID-mediated interactions. Fig. 2. (A) Strategy for the identification of the RCD1-binding SLiM and expansion of the RCD1-interactome. (B) Transcription factors use the same SLiM (marked in black) for interactions with RCD1. However, while structure was induced in the SLiM of one of the transcription factors (brown) upon RCD1-interaction, no structure induction was detected in the SLiM of other transcription factors (different colours) after RCD1-binding. Different forms of the transcription factor, referred to as fuzziness, may be present in the complex. Strikingly, ID-regions surrounding the SLiM also affect binding – both negatively and positively. These findings led us to propose a model according to which the transcription factors bind RCD1 using different structures but the same SLiM – possibly after induction by the same biological stress factors (Fig. 2B). Several human hub proteins also use positive and hydrophobic amino acid residues for binding of their ID transcription factor partners. Examples include the TAF4 hub, which coordinates basic functions in gene regulation, and RelA of the NF-kB family, which plays a vital role in cellular immune and inflammatory responses. The binding model is therefore of broad relevance – from improving food security by breeding plants with enhanced drought stress resistance to improving understanding of human diseases. Thus, in the future, not only structured proteins, but also ID proteins and their SLiMs will have to be considered when looking for new drug targets. Structures and Short Linear Motif of Disordered Transcription Factor Regions Provide Clues to the Interactome of the Cellular Hub Protein Radical-induced Cell Death1.